What went down on Saturday? C2E2 went down. C2E2 is one of Chicago's larger comic cons. It's at McCormick Place, which is a giant convention center south of downtown, and nerds from far and wide gather to get things signed, walk around in costume, and go to panels about Lady Representation in Comics (note: not actual panel name). My friend Doug and I went as Dr Sattler and Ian Malcolm from Jurassic Park. IT WAS MY FIRST TIME COSPLAYING so everyone can just reserve judgment for next year when I am awesome at it. Doug put a dinosaur head on a sawed-off rake and dipped a mop-head in fake blood and carried that around all day, and I tied a can of Barbasol to my backpack and carried around a plastic cup of water. It was a loving tribute. But this is the thing. This is the thing about conventions. People are there because they are EXCITED. They're real damn jazzed about everything that's going on, and you can wear whatever the hell you want, and someone will stop you and be so happy you're dressed as that thing, because they love that thing and you have 1) reminded them of it, 2) cared about it enough to invest some real energy into it. Yeah, there's probably some sexist crap that goes down, but you can avoid the booths that sell that kind of art, and of course, I personally was not harassed, no matter how pleated my shorts were. So we mainly just walked around the floor for six hours. We went to no panels, because why would we do that, but we did have some nice sittin' time where I drank iced coffee and took selfies while Doug napped. It's the Gen X/Millennial divide. 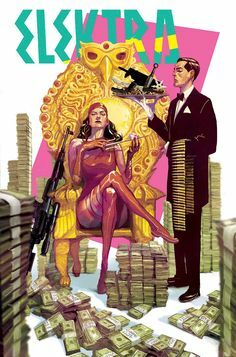 So he signed my volume 1, which I'm still waiting to finish, because I started it then realized there's a ton of Elektra backstory and THEN I found out she was introduced in Frank Miller's Daredevil, so now I've got the Daredevil omnibus on hold at the library and basically I'm gonna know a lot about Elektra when this is all over. Bill Willingham was also there, signing Fables and whatever else he's done. He seems pretty prolific. He seemed very nice, but he made me think about signing etiquette. Because IS there signing etiquette? I got there way early and was maybe fourth in line, and I didn't have jack-all to do, so I was fine with people ahead of me taking their time, but there were a LOT of people behind me, and his signing was listed as lasting an hour. The people ahead of me took mayybe ten minutes. Also! ALSO A THING HAPPENED and that thing is that I stood in line for half an hour to meet Max Brooks, which meant I was the first in line, immeeeediately in front of two nerds whose nerdiness put mine to shame, but that was ok, because C2E2 isn't about judgment. Max Brooks, for those who do not know, is the son of Mel Brooks (Blazing Saddles, Spaceballs, Robin Hood: Men in Tights) and Anne Bancroft (The Graduate, The Miracle Worker), and RATHER THAN REST ON THOSE LAURELS, he decided to write one of the greatest books ever, which is World War Z. I do not speak lightly in this case. I've read a damn lot of books. And WWZ is the pants. 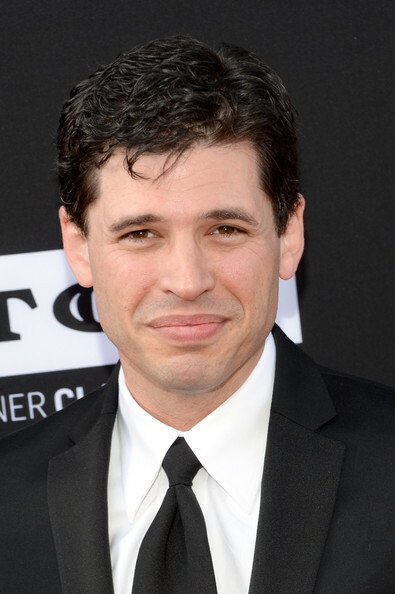 And Max Brooks is not just the son of immensely talented people, not just one of the best writers I've ever read, but is also a charming sweetie pie of a man. He got to the signing 10 minutes early, and since I was at the front of the line, all of a sudden I was told to go and I WAS NOT READY, so I grabbed my backpack and went "ahh!!" and got my copy of WWZ out. He's just nice, damnit. He's a nice guy. I've been to a lot of author signings and he just radiates non-jerkiness. I told him I majored in 19th century literature and his book is in my top 5 books of all time (TRUFAX) and he was just like "Really?" I asked him to write one of his favorite words, and unlike some people *cough*DonnaTartt*cough* he looked genuinely happy about it. And then chose dork. I enjoy that it looks like derk. When you leave a con and go back to the regular world, it's kind of a letdown. The regular world is full of people who thinks it's off you're wearing khaki pleated shorts and a blonde wig downtown. 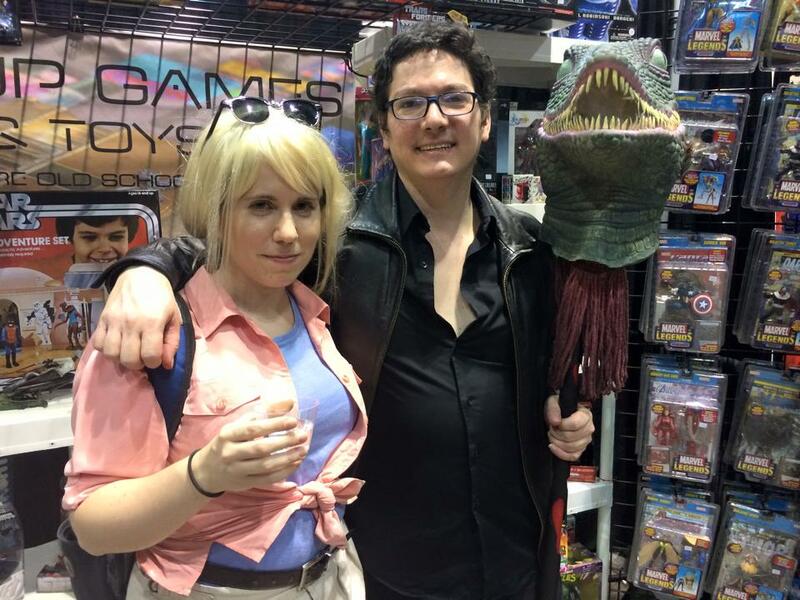 ConWorld is full of people who will stop and shriek and ask to get a photo with you because they love Jurassic Park so much and saw it in theaters when they were seven and how excited are you about Jurassic World (answer: "hesitantly excited"). People are just so jazzed about things at cons. If you have the opportunity and are AT ALL interested in anything they have a con about, you should go. Plainclothes is fine, people. But I warn you: I did that last year and then immediately decided we had to dress up the next year. And it was even better. Planning my costume for next year now. Much to think about. C2E2 is the best.